Bill4Time is an online solution that helps professional service firms run their business more effectively by combining time & expense tracking invoicing & payments, client & project management, and accounting capabilities in a single, easy to use system. 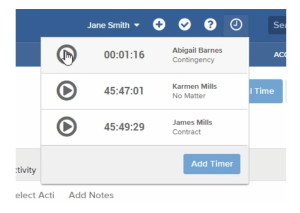 Although intended for any professional who works on projects for people and bills his/her time to client, Bill4Time also includes specific features to fit the needs of Accountants and Lawyers. It is designed to be simple but also offers customization features to suit larger, more complex projects. 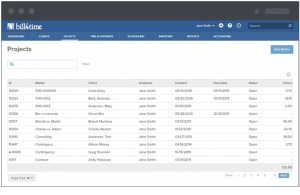 Bill4Time provides all of the basic functionality needed to properly track time and expenses, manage clients and projects, assign tasks, create and send invoices, accept payment and integrates with Quickbooks. During our 30 day free trial we identified a number of distinctive benefits that will help professional service firms make their day-to-day business operations easier. Conflict checker to ensure projects do not get duplicated. Create standard project types for when you have many clients with similar needs. Tons of training videos and information sessions. Superior customer support. The Bill4Time software solution is highly robust, affordable and intuitive. Key Features include time tracking, billing and invoicing, mobile phone app, expense tracking, online access, customization, desktop widget, project management tool, client management, security and user access, accounting and reports. For some businesses, more than 30 percent of billable time is lost due to poor timekeeping. Now it’s easy to accurately and quickly track time with Bill4Time. No more spreadsheets, sticky notes and pads of paper to track time. Easily capture your time in real time. Start a timer on your phone, tablet or desktop. Enter time anytime – in your office or on your mobile device. With Bill4Time, you can capture every minute and bill what you’re worth. Quickly create, print or email professional, branded invoices in minutes. Create pre-bills, detailed invoices and statements. Set payment terms, currency and late fees. Offer flat rate or percentage discounts. Know the status of every invoice with just a click. For added client convenience, seamlessly link your invoices to online payment options and get paid faster. Bill4Time is used by professionals in a broad range of industries. Within those industries, the terminology differs as to what is defined as a project. If you’re an accountant or consultant, you may call it a project, an engagement or assignment. If you’re a legal professional, it’s most likely called a matter or case. With Bill4time, you can call a “project” anything you want by easily changing the default label to suit your profession. Project Management feature helps you organise, plan, track and better run your entire business. Your clients and your Project get the same attention. Stay Organised – Separate time and expenses, add files and notes and keep up with accounting all in one central location. Detailed Invoicing – Clients often delay remitting payment if they don’t understand the invoice. Provide details by creating and assigning activity for a Project. Clients get the information they want and you get paid on time. Collaborate – Eliminate wasting time by doubling efforts. The Project dashboard shows time and expenses entries for each team member and the shared schedule shares future activity of all members assigned to that individual Project. Email Notifications – Every Project has a customizable notification center. Each team member can be updated on the activity that matters most to them at the time it happens. The system is highly customizable. The Bill4Time “quick create” feature allows users to easily create projects using terminology specific to their industry. For example, an accounting firm may create projects and assign tasks specifically associated to the accounting cycle, bank reconciliation, or income statements. Law Firms project types may include research, witness interviews, client meetings, jury selection, and case preparation. It allows users to easily create the categories important to the daily operations that require time tracking. The Bill4Time Project Management Tool is easy to set up. Project Managers can assign projects to specific clients at an hourly rate, flat fee or contingency basis. The project manager can also invite specific people such as other project manager, accountants or clients to view the project. To help keep your projects organized, Bill4Time’s project management tools allow users to import files, track time and expenses, schedule meetings, manage payments and adjust billing rates on a per project basis. Access your data whenever and wherever you are. As mobile usage continues to rise, running a business via a mobile device has not only become commonplace, it has become a necessity. According to a PeoplePerHour study, 73 percent of business owners use apps to run their business on a daily basis. Bill4Time has you and your business covered–on–and offline. Bill4Time mobile works even when you’re offline and automatically syncs once an Internet connection is available. Leverage your iPad, iPhone, Android and BlackBerry device anytime. Whether you’re in the office or on the go, Bill4Time keeps you connected. Bill4Time offers 3 pricing plans to fit the needs of small to medium sized organizations: Solo, Pro and Enterprise. Time and billing: at $29 per user/month – Robust time & billing features for professionals. Legal Pro: For $49 per user/month – Increase productivity with Legal Pro. This plan streamlines workflows for legal practice management. 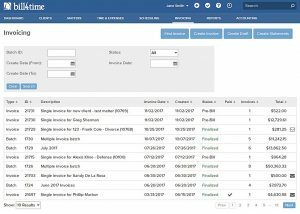 Legal Enterprise: $89 per user/month – Customizable features to help you increase productivity in your firm. Save up to 10% with the yearly pricing plan. Since the Bill4Time system is charged on a per user per month basis, there are no long term contracts or cancellation fees. There are also no additional costs or hidden fees associated to tech support, back ups or online training modules. It’s all included! Bill4Time was founded in 2006 by parent company Broadway Billing Systems and is now a leading web-based time billing software solution serving professional service firms of all sizes. The system was created with the guidance of law and consulting firms to be simple to use, intuitive and efficient. By all accounts, the company values customer input and strives to provide a high quality and secure system. They report a 99.99 percent uptime and offer a free 30 day trial without a credit card. The company is well-established and offers various levels of customer support including weekly webinars, recorded training, YouTube training, phone, email and chat supported customer support. It’s no surprise why so many professionals have chosen to trust the Bill4Time system. Based on our review, we are happy to suggest Bill4TIme as a user friendly, reliable and reasonably priced option for professional service firms who need to track and bill their time & expenses against clients and projects. In particular, we believe lawyers and accountants will appreciate what it has to offer in terms of industry-specific understanding and features. Here you'll find out about recent company news, updates to our offerings, and other useful information about software selection.